Dr. Ali E. Guy M.D. Our practice, understands that after sustaining an injury or a debilitating disease it may be hard to get to a specific Doctor’s location, so we have tried to make it more convenient for our patients by having four office locations; Manhattan, Bronx, Yonkers and Long Island. Our accommodating, knowledgeable and friendly staff will make you feel right at home. We work together making sure all your needs are met. Whether it may be making sure your insurance is verified or calling a car service for you, we try to make all of our patients feel part of our family. Our staff is fluent in Spanish, Persian, Punjabi, Urdu and Hindi. 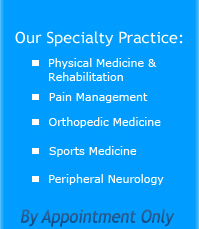 Patients in our offices benefit from our unique working relationship with our therapy and medical staff. There is ongoing communication between Dr. Guy, our Physiatrist, physical therapist, massage therapists, and our acupuncturist who work side-by-side in the same office. Our therapy staff maintains an exceptionally high-level of academic expertise. Dr. Guy is a clinical instructor of physical medicine & rehabilitation at NYU School of Medicine/NYU Medical Center. Copyright © Ali E. Guy M.D.